MOTIVATE & DISRUPT YOURSELF – 3 Goal-Setting Strategies to Lose “Wait”! The new year marks the time when many people reboot their efforts to improve the quality of their life and work. Your success hinges on the goal-setting strategies you choose. This year I decided to get a head start on my resolutions by starting on them this fall – and one is to become more fit. Getting fit and losing weight consistently show up in the top new years resolutions, and I lost 30 pounds! It is exciting, because I have other goals on my list that are also moving along toward their destinations. Chances are, you know some worthwhile goals that could greatly improve your career and personal life, so what are you waiting for? How can you “lose the wait” this year and move closer to living your dreams? Studies show that about 50% of the people around you will make new years resolutions as a way of motivating themselves to be better. But, by February many of them will start wavering and lose focus because they lack effective goal-setting skills. A University of Scranton study confirms only 8% of your family and friends will go on to achieve their new years resolutions. If you want to earn a spot among the successful 8% – if you really want to disrupt yourself, consider these key factors that will greatly influence your success. Motivation is the key that unlocks your true potential. Things become easier when you tap into how you are naturally motivated. You have unique drivers that motivate or de-motivate you on a daily basis. You might think of them as your very own combination lock. Although they may be out of your conscious awareness, these drivers influence whether you procrastinate or get things done on your daily “to do” list. Therefore, it helps when you align goal setting with your natural motivation drivers. I am enjoying greater success with fitness goals this year because the program I chose matches some of my core drivers. I reviewed the results of the motivation assessment that we use in our coaching programs and I score very high on four things: information, structure, consistency and alternatives. I have tried other nutritional programs before, but the one I chose this time fits all four patterns: First, the information made sense to me, and it changed how I think about fuel for my body. Now, when I walk into a grocery store and look around at the food options, I find only about ten percent of it appealing. I literally see the grocery store in a new way. This year we visited with family at Thanksgiving and I came home two pounds lighter, because I now think differently. Changing your thinking is crucial to changing your behavior and creating new habits! The nutrition program also matches my motivation preferences for structure and consistency – yet has enough alternatives built in that I don’t become bored and lose interest. When you match your goal-setting strategies with how you are naturally motivated, your chances of success greatly increase. Brain scientists and psychotherapists have teamed up and used MRIs to discover how habitual behavior is created. It is not surprising that we all have default thinking, which leads to default behavior. Their studies show that in order to create a new habit, you must create thinking patterns that create new neural pathways and memories, which become your new default thinking and behavior. One of our executive coaches provided another great example of this when she got to go to a BMW driving school. One of the school’s success principles is, “Focus on where you want the car to go – instead of focusing on the cones that you don’t want to hit.” To form new habits, change your self-talk and thinking to support the creation of new neural pathways. In other words, build a new road, instead of focusing on avoiding or dodging the potholes in the old road you’ve been traveling. You can build a house without a plan, but you may not end up with a livable structure – and the same is true with New Years resolutions. Good goals start with good plans. A remarkable study conducted in the Harvard MBA Program points out the importance of having a plan for your goals. The study focused on graduate students. Some of them committed to goals and others did not. 3% of the students had written goals with plans to accomplish them. 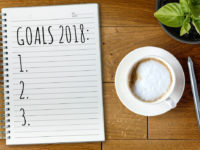 Another 13% had goals in their minds, but did not write them down. 84% of the students had no goals or plans. Ten years later, Harvard found the three percent of students with written goals and plans earned ten times as much as the rest of the class combined! Those who plan to succeed – succeed with a plan! Why not dare to plan and dream as you consider how to improve your quality of life and work this year? Rebooting your goals can be rewarding, but choosing goal setting skills that match your natural preferences is paramount! Here’s wishing you the very best in the new year. Be among the elite 8% this year and enjoy the rewards of achieving your goals! Get in touch with us today to discuss how we can help you achieve your goals. We provide leadership and communication coaching to help people be their best. Also, please leave a comment about this article and share it with others. If you would like to receive other tips to advance your skills and career, you will find the SUBSCRIBE button on the top, right hand side of this page. Our team provides award-winning soft skills strategies to help leaders & Fortune 500 groups achieve their business goals. We provide consulting, coaching and training services in: media strategies, leadership development, communication / soft skills, reputation management, stakeholder engagement and storytelling / presentations. Benchmark has consulted with and trained leaders and associates from all 50 USA states and more than 25 countries.